Famous March 12 people are Pisces who are not afraid of much. They like living on the edge. Some people only exist but they put the L in Life. Those of you born on this day like the famous people born on 12 March are extremely talented communicators. They always know the right words to say and try to avoid confrontations. On the other hand, those who share this famous March 12 birthday have a candid side that many find hurtful. But sometimes, it is necessary. Before becoming a parent, it is suggested that they take care of the past and any negative emotional childhood ties. The lovers or prospective life partners of famous people born on March 12 should be able to challenge them and to complement them as well. The career choice should be one that will allow them to use their imagination and one that is fun. When it comes to health, famous people born on March 12 should make time to exercise. This could mean playing a game of tennis or taking walks after dinner. It’s up to them but they need to take care. 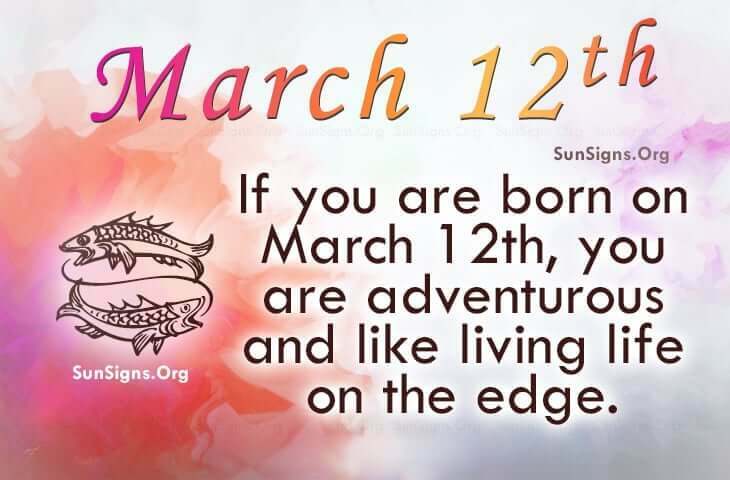 Famous people born on March 12th are Pisces who love surprises and living life on the edge. The March 12 famous birthdays horoscope profile shows them to be playful and agreeable. They have many options as a career. Overall, they are successful individuals that any lover would be lucky to have.